LeEco, the Chinese electronics maker partnered with electric-car startup Faraday Future, is digging its heels even deeper into the US. The Beijing-based company just bought nearly 50 acres of land that belonged to Yahoo. The asphalt is situated near Levi’s Stadium in Santa Clara, California. The acquisition adds 3 million square-feet of space for LeEco’s operations, which span smartphones, bicycles, virtual-reality headsets, and, eventually, electric cars. The added space also creates room for at least 12,000 additional employees. The Silicon Valley Business Journal reported Friday that LeEco paid $250 million for Yahoo’s old property — $106 million more than what Yahoo paid in 2006, according to the publication. 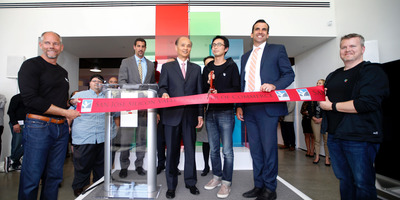 In April, LeEco opened its first US headquarters in San Jose. The company, led by Chinese billionaire Jia Yueting, is among a handful of international tech conglomerates attempting to challenge Tesla in the electric-car space in the US. Tony Avelar/Invision for LeEco/AP ImagesLeEco executives and officials with the California city of San Jose celebrate the grand opening of the Chinese tech giant’s Silicon Valley headquarters. LeEco is working with Southern California-based Faraday Future, and has developed its own self-driving electric car. One of LeEco’s next-door neighbours in San Jose is NextEV, a venture-backed startup also aspiring to build an electric car from the ground up. The land sale could be a boon for Yahoo, which is in the process of selling its core business — comprised of its internet assets, real-estate properties, patents, and some licensing deals. clusterstock jia yueting leeco marissa mayer moneygame real estate sai-us silicon valley yahoo!